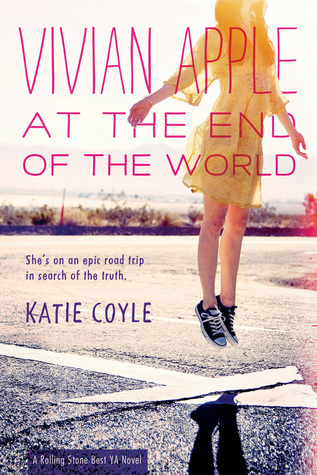 Over the summer, I attempted to listen to the audiobook version of Vivian Apple at the End of the World by Katie Coyle. As I criss-crossed the state of Texas, I quickly lost track of Vivian and Harp’s whereabouts, and I abandoned the book until early October. Although I am only about halfway through the novel (and I probably won’t formally review it when I am done), the basic premise of the story has left my mind curious. Seventeen-year-old Vivian Apple never believed in the evangelical Church of America, unlike her recently devout parents. But when Vivian returns home the night after the supposed “Rapture,” all that’s left of her parents are two holes in the roof. Suddenly, she doesn’t know who or what to believe. With her best friend Harp and a mysterious ally, Peter, Vivian embarks on a desperate cross-country roadtrip through a paranoid and panic-stricken America to find answers. Because at the end of the world, Vivian Apple isn’t looking for a savior. She’s looking for the truth. Vivian Apple isn’t looking for a savior. She’s looking for the truth. Nonetheless, it is easy to think that we don’t need a Savior, we just want the truth. Furthermore, we want OUR truth, the truth that works for us personally. That truth can be anything as long as it makes sense to us and meets our personal needs. Jesus is the truth. John 14:6 does not say that He “could be” the truth or “might become” the truth or “was” the truth. He is the truth. That truth is not relative or changing. So if Vivian Apple only needs the truth, she needs Jesus. The truth is that Jesus is also our Savior. To believe the truth is to believe that He died for our sins, was buried, rose again, and is the Savior of the World. You cannot separate the fact that Jesus is truth from the fact that Jesus is Savior. So if Vivian Apple needs the truth, Vivian Apple needs a Savior.